When Cassidy Turley joined forces with DTZ, they brought another global company to San Diego. As one of the top three commercial real estate firms across the globe, DTZ has a presence across Asia, Europe and the Middle East helps connect San Diego to the rest of the world. From Oceanside to Otay Mesa, DTZ works to make sure San Diego companies have the creative space they need to thrive. This week, we sat down with Dan Broderick, regional managing principal of DTZ’s Southern California office, to learn more about the company’s merger and plan for future growth. 1) Tell us about DTZ. Cassidy Turley and DTZ have officially joined forces under new ownership and a new international DTZ brand. Combined, DTZ is a top-three global commercial real estate services firm, offering clients a complete suite of services in all major markets worldwide. At DTZ, we are market leaders, industry leaders and community leaders. Clients recognize us for the creative sophistication of our real estate advice as well as for the discipline and accuracy of our service delivery. Our thorough understanding of local business practices and market dynamics, combined with our customer focus and service commitment, give our clients a distinct edge in commercial real estate in San Diego. Our focus on exceptional client service and community involvement is because of our unique and exciting culture. We work hard as a team with a like minded purpose and we believe our success is measured by the success of the clients and communities we serve. We don’t just work in our communities, we belong to them. America’s Finest City – for anyone who has spent any time here – needs no explanation. It is a special place in the world; a very diverse city fraught with opportunities. As one of the most educated cities in the United States, San Diego’s skilled workforce feeds thriving biotech and telecom industries. The region is also home to largest military presence in the world. These unique advantages continue to encourage economic growth which, in turn, further fuels the commercial real estate market. As the market continues to get healthier, we have seen tremendous business growth with unemployment down to 5.2 percent. Of course, we have the small advantage of having over 70 miles of coastline, rugged mountains, world class golf, amusement parks, and the best weather in the continental US! D&K Engineering is one of San Diego's finest. They are driving leading manufacturing, product design, technologies and processes for highly innovative products and equipment on a worldwide scale. They were instrumental in developing the San Diego success story, EcoATM, and they have designed, developed and manufactured highly complex products from medical devices, to 3-D printers, to military mechanics. Simply put, D&K Engineering bridges the gap between concept and reality. The new DTZ creates a culture that values extraordinary client care and exceptional service under the premise that we are growing to get better, not just bigger. Our customers can look forward to complementary product lines that together create a broader spectrum of commercial real estate solutions. Our plan is to pursue options for using our combined capabilities to optimize existing service lines. We also expect to expand capacity in strategic service lines and industry sectors to meet and exceed client requirements. 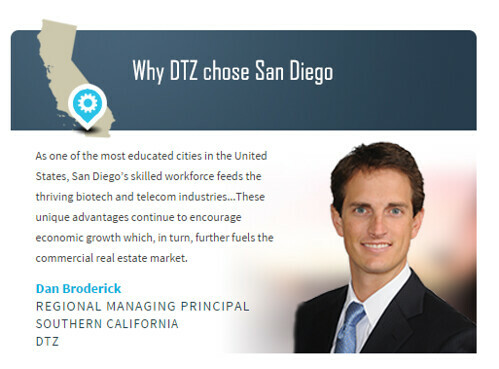 San Diego continues to put itself on the map and grow each day and DTZ will continue to advance alongside of it. 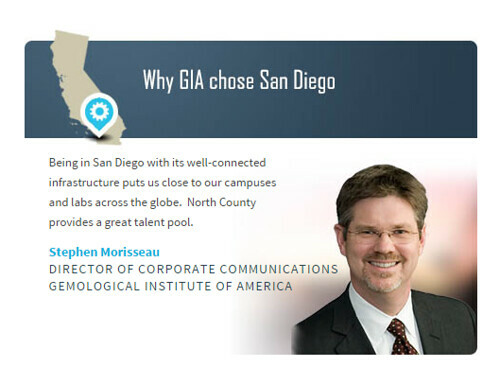 In the heart of Carlsbad sits the Gemological Institute of America (GIA). Since its founding in 1931, the institution has educated more than 350,000 professionals in virtually every sector of the jewelry industry. But they are not just an educational institution – they’re also a jobs generator. Since 2013, GIA has brought on 130 diamond graders, and they’re looking to hire 80 entry-level positions in 2015. From India, to Thailand, and the U.K, GIA has 17 locations worldwide, yet the company remains proudly headquartered in San Diego’s North County. We sat with Stephen Morisseau, director of corporate communications at GIA, to learn more about the company’s growth plans and why they love calling Carlsbad home. GIA’s campus in Carlsbad is unique in the gem and jewelry industry. First and foremost, we are an educational institution, helping people prepare for careers in the global gem and jewelry trade. Our students come to Carlsbad from across the country and around the world, taking home an excellent impression of the region and helping more people learn about San Diego. We conduct leading-edge research into gemstones. World-class scientists use our unique resources to delve into the nature and origin of diamonds, rubies, sapphires, pearls and many other gems. GIA’s campus in Carlsbad houses the Richard Liddicoat Gemological Library and Information Center, the largest and most complete collection of its kind. Lastly, we work to protect consumers by providing gemstone identification and grading reports that help ensure their trust in the gems and jewelry they purchase. Being in San Diego with its well-connected infrastructure puts us close to our campuses and labs across the globe. North County provides a great talent pool. We are very proud to be part of the North County community. That said, the city of Carlsbad has done a great job of attracting new companies while maintaining the quality of life that makes this an attractive place for so many firms and people. Global demand for educated, well-prepared professionals drives demand for our education programs, just as consumer interest in having an independent, third-party evaluation of the qualities of their gemstone jewelry drives demand for our identification and grading services. We anticipate continued growth, both as a global and a local institute. For San Diego, we see the region meeting the challenges of moving America’s Finest City forward. In early 2014, Citizens Business Bank – a financial services company based in the Inland Empire – made the decision to open up shop in San Diego. 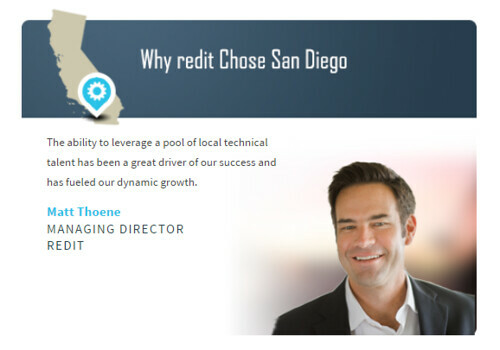 Bringing its focus on community-centric banking to the region, they set out to tap into San Diego’s strong manufacturing and real estate firms. 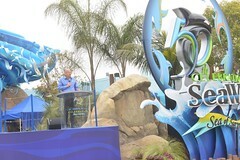 In less than a year of operations in the San Diego market, they have already had much success. 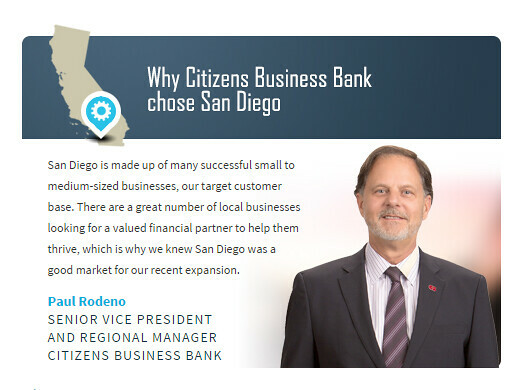 A newcomer to EDC’s investor list, we sat down with Paul Rodeno, Senior Vice President, Regional Manager of Citizens Business Bank in San Diego, to learn about this bank’s regional growth plan. Citizens Business Bank is a financial services company with a bank at its core. Our roots in community banking lend us a unique capability to provide large bank products and solutions with the hands-on touch and personal attention of a local community bank. We provide business banking solutions across government and nonprofit organizations, as well as industrial, title & escrow, dairy & livestock, medical, property management, and real estate industries, among many others. For over 40 years, Citizens Business Bank has thoughtfully emphasized and represented what is great and essential about community banking: a focused approach on the customer, and the many ways the bank can help them achieve more for their business, their employees, and the customers and communities they serve. The San Diego market is made up of many successful small to medium-sized businesses, our target customer base. There are a great number of these successful businesses that are looking for a valued financial partner to help them thrive, which is why we knew San Diego was a good market for our recent expansion. We aim to work with the best privately-held and/or family-owned businesses throughout California, and will maintain our focus across industrial, manufacturing, medical, property management, title & escrow, nonprofit, and agriculture businesses. All of these industries are well-represented across the region’s dynamic economy. It’s impossible to pick one company, so here are a few: Qualcomm, with a great local and international presence, is an iconic brand. Add other innovators, such as ViaSat, Stone Brewing Co., who is leading the craft brewing boom, and action sports firms such as Nixon, SKLZ, and prAna. San Diego State University, my alma mater, has a tremendous entrepreneurship focus; and the University of San Diego, where I sit on the board of the School of Business, has great rankings, which contribute to the growth of ideas while educating future leaders. As a great local non-profit, California Southern Small Business Development Corporation is a community development lender providing over 600 loans totaling $56,000,000 in the past five years. Citizens Business Bank will be the premier business and community bank in the State of California with a focus on continued growth, enhanced lending initiatives, acquisitions, and our valued relationships with our customers. 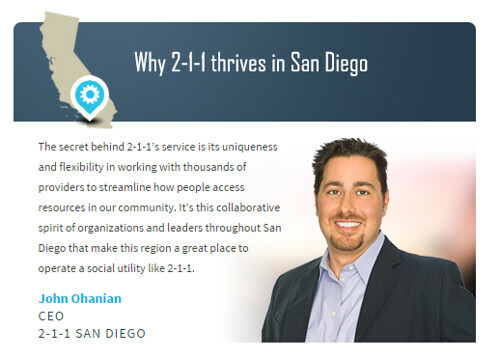 We kick off our first investor spotlight of 2015 with an interview with John Ohanian, CEO of 2-1-1 San Diego, to learn more about how this valuable organization connects with the business community and makes San Diego a better place to live. Tell us about 2-1-1 San Diego. Most San Diegans know when there is a disaster, like a wildfire, they can dial 2-1-1 to speak to a live person 24/7 to get the most up-to-date information on evacuations, road closures and shelter information. What most people may not know is they can turn to 2-1-1 any time to connect to more than 6,000 community and health services, including affordable health insurance to food or financial assistance, housing resources, substance abuse treatment, care for a child or parent with dementia, resources for our military and veteran community or a grandparent raising their grandchildren. With thousands of services in our community, finding help can sometimes seem impossible. And that’s where 2-1-1 San Diego comes in. 2-1-1 also provides vital trend information on community needs to foundations and government officials to assist leaders assess and plan for a better future for the San Diego region. What makes San Diego a good place to operate an organization like 2-1-1? The secret behind 2-1-1’s service is its uniqueness and flexibility in working with thousands of providers to streamline how people access resources in our community. It’s this collaborative spirit of organizations and leaders throughout San Diego that make this region a great place to operate a social utility like 2-1-1. While 2-1-1 is not a government agency, but rather a local nonprofit organization with an established business model of fee-for-service contracts, we have strong and longstanding partnerships with corporate, philanthropic and government partners like the County of San Diego, SDG&E, Qualcomm, and Susan G. Komen that have changed the San Diego landscape of how people connect to community resources. Whether it’s establishing technology roadmaps together to make sure 2-1-1 is ahead of the curve to better serve the community, or providing a one-stop-shop for people seeking resources for breast cancer, to utilizing 2-1-1’s contact center platform to raise awareness about benefits callers are entitled to, 2-1-1 and our valuable partners work together to meet the needs of our community. San Diego is full of dynamic companies, firms and service providers influencing global trends and innovation. Pick another San Diego company or organization that is at the top of its game. For 40 years, Nuffer, Smith, Tucker has been a leading community pillar in San Diego. Offering all the bells and whistles of a high profile corporate entity, Nuffer, Smith, Tucker fashions itself a boutique communications firm, providing trusting and intimate client/executive relationships and high-quality creative services through reliable and trusting staff who take clients on journeys to explore possibilities. They take ideas and create a vision, and then bring that vision to life. What do you anticipate for your organization in five years? What do you anticipate for San Diego? At our 10-year milestone, 2-1-1 has made more than 2.5 million connections to community, health and disaster services. When we reflect on those connections, we see our community connecting with us in multiple channels, beyond our easy to remember 3-digit phone number. We are developing mobile websites, apps and engaging our social media platforms and chat capabilities. We envision a community-wide ecosystem of organizations that share data, resources, and solutions; and ultimately where customers, 2-1-1 and service providers work toward solutions together. We are currently working with our public safety partners to ensure that 2-1-1 can provide assistance directly with First Responders when they face families and individuals with daily non-emergency needs such as food, housing and other health care options. We are also building on existing partnerships with fire, police and other jurisdictions to share critical information during times crisis. 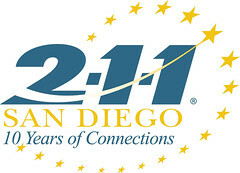 In our immediate future, we are kicking off our 10-year anniversary at the Annual 2-1-1 Connections Luncheon on February 20 at the San Diego Convention Center. Most people have heard of AT&T. But what they don’t know is how closely they work with the community. As one the nation’s largest wireless service providers, they are committed to connecting San Diego – and its non-profits, businesses, and residents – to other entities across the globe. 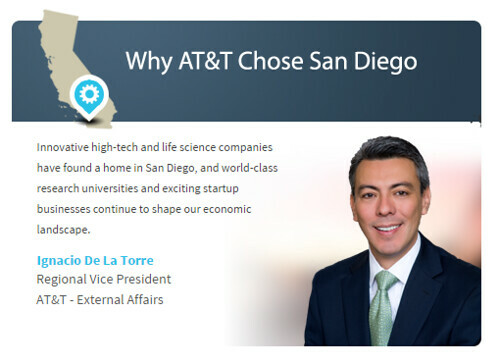 This week, we sat down with Ignacio De La Torre, regional VP, external affairs for AT&T, to learn more about how they view their relationship with San Diego. 1) Tell us about AT&T. AT&T is a leading provider of wireless, Wi-Fi, high speed Internet, voice and cloud-based services. AT&T has nearly 3,700 employees working in the San Diego and Imperial Counties region and has strong relationships with various community organizations including: Junior Achievement, Operation Homefront, United through Reading, Urban League of San Diego County, Imperial County Community Foundation, and Barrio Logan College Institute. AT&T is committed to investing in San Diego. For example, this past November, AT&T made a $300,000 contribution to Interfaith Community Services to support its Transitional Youth Academy, a program to improve academic and career outcomes for under-served youth. AT&T also has two “Store of the Future” locations in San Diego County, which are focused on customers’ lifestyles and allow customers to interact with new technology products creating a fun, unique and interactive shopping experience. San Diego continues to outpace the rest of the nation – and much of the world – when it comes to job creation and economic recovery. In fact, a recent report by the University of San Diego found that San Diego County is on pace to add more than 30,000 jobs for the third straight year. San Diego’s economic success is fueled in large part by the growth of the “knowledge-based” economy, its climate, and its geographic location enabling ease of trade and global commerce. Innovative high-tech and life science companies have found a home in San Diego, and world-class research universities and exciting startup businesses continue to shape our economic landscape. AT&T is a part of this economic growth and prosperity, and is excited to be a part of San Diego’s future. Organizations such as CONNECT, EvoNexus, and CommNexus have changed the way that businesses are formed. Through their collaborative approach in working with investors, inventors, industry and service providers, they offer incubator platforms for technology and life sciences start-ups, which has helped grow the San Diego economy. Thousands of jobs and hundreds of millions of dollars have been realized as a result of their tremendous work. In the past five years, the mobile Internet along with smart phones, applications and tablets have transformed our world in how we work, shop, communicate and socialize. AT&T will continue to lead this innovation and growth, and in the next five years, we expect to see all devices becoming more connected, more user-friendly and more intelligent. In fact, by 2022, the average household with two teenage children will own roughly 50 Internet-connected devices, up from approximately 10 today, according to estimates by the Organization for Economic Co-operation and Development. San Diego is ideally situated to be a leader in this new technology wave. As a leader in technology advancement, San Diego will bring incredible economic opportunities for businesses and individuals alike. Not only does Barney & Barney know how to assist growing companies, but they’ve also seen growth of their own. In the past seven years, the firm has doubled in size in San Diego, housing 400 employees at its UTC location. 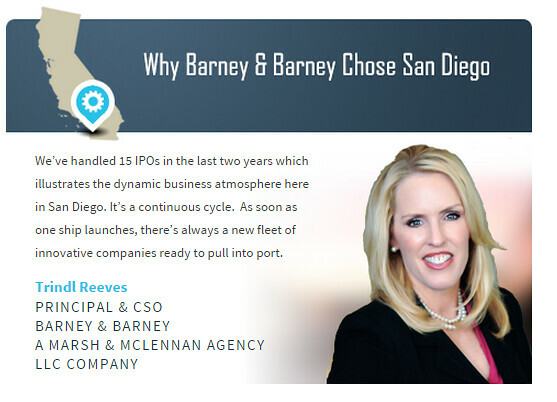 This week, we learned more about Barney & Barney’s growing San Diego business from Trindl Reeves, principal & CSO. Barney & Barney provides insurance, risk management, executive liability and employee benefit solutions to companies and private clients. We’ve been serving the San Diego community for over 100 years. It’s this stability along with adherence to our core values that has allowed us to grow without losing the culture that makes us who we are. In February of 2014, Barney & Barney became the Western region headquarters for Marsh & McLennan Agency, a group of brokers nationwide dedicated to serving the middle market. This unique structure enables us to operate autonomously and retain our culture while bringing ever greater resources to our clients though our parent company Marsh. In San Diego, where our clients are also growing quickly and expanding into emerging markets, this distinctive model provides the best of both worlds. We share a long history with San Diego. It’s our hometown. San Diego offers a vibrant culture, an interplay of innovation and integrity, creativity and commitment. We very much see ourselves as part of this interconnected community and continually look for ways to nurture those connections. San Diego fosters a business environment ripe for rapid growth and so it’s no secret that sometimes enterprising companies become attractive acquisition targets. What’s advantageous about San Diego is the collaboration that acts as a buffer when companies enter the next phase of their growth. What may seem like a loss quickly turns to opportunity for new growth, for the next innovation, whether it’s in life science or technology or hospitality. The next entrepreneur is right there, designing, creating, building. We are honored to be part of this business community and to be here to advise and advocate for those companies as they evolve. Human Longevity, Inc. is one that comes to mind. They epitomize the possibilities for a company in San Diego. They’ve increased their personnel from 25 to 80 employees in three months. HLI is taking what was once only a whisper of hope for people suffering from cancer, diabetes, and heart disease and creating advances in prevention, diagnosis and therapies that increase longevity and improve health. Remarkable science matched only by their vision. Thanks to our clients, we’ve doubled in size in the last seven years, employing 400 associates here in University Town Center alone with no signs of slowing down. We expect to grow by that measure again in five years both through continuing our local, organic development and by expanding our footprint across the West. While change always comes with some growing pains, we are confident in the culture we have established over the last century. We remain committed to serving our clients, colleagues and community. Part of that commitment includes giving back to the community through the Barney & Barney Foundation. Last year, the Foundation passed the $1 million mark in donations and over the next five years we look forward to giving more to the communities we serve. San Diego is not going to slow down either. We’ve handled 15 IPOs in the last two years which illustrates the dynamic business atmosphere here in San Diego. It’s a continuous cycle. As soon as one ship launches, there’s always a new fleet of innovative companies ready to pull into port. And Barney & Barney will be there to support them. If you ask companies why they chose San Diego, more often than not, they will mention a combination of three things: the availability of talent, a strong innovation economy and access to Mexico. Global IT company KIO Networks - formerly redIT - will site all three. Since opening its first facility in Kearny Mesa in 2001, KIO Networks has seen its data business boom and has grown its San Diego and Tijuana footprint as a result. We spoke with Matt Thoene, managing director, for this week’s spotlight. 1) Tell us about KIO Networks. KIO Networks is a global technology company that provides managed IT services, high-capacity connectivity and data center services for a wide range of organizations in the U.S. and Latin America. Our job is to enable companies to focus resources on what drives their competitive advantage – not the distractions of owning and managing IT – for a lower total cost of ownership than if they were to set up, implement, and manage it themselves. Our managed cloud service offerings are focused at the “infrastructure as a service” level, so we're providing the facilities, hardware, and support that our clients rely on for the applications that are mission-critical to their business. A key differentiator for our San Diego business is our cross-border connectivity. We have more than 1,000 miles of fiber throughout Mexico which provide connectivity to U.S. based businesses that need access to their facilities and businesses in Tijuana and throughout Mexico. 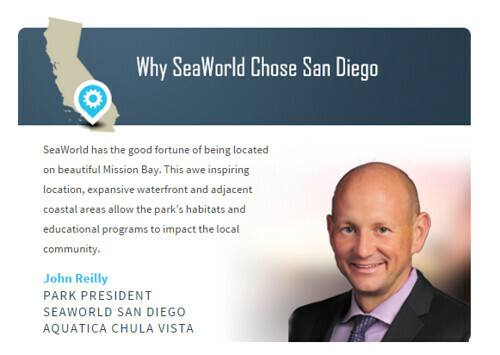 2) What are some advantages of doing business in San Diego? The fact that one of our primary services is providing cross-border connectivity to an extensive fiber network in Tijuana and throughout Mexico is the largest advantage to being located in San Diego. We have helped customers stretch their critical applications from our world class secure data centers here in San Diego to the door of their facilities in Mexico with little latency. It is essentially as if KIO Networks can provide a fiber cross connect and all on the KIO Networks infrastructure to a client’s door internationally. In addition, the ability to leverage a pool of local technical talent has been a great driver for success in our business and has fueled our dynamic growth. I would have to select Cyberflow Analytics. I’m impressed with their innovative approach to security and system analytics. Their approach leads to early detection of advanced-persistent threats (APTs) and other anomalous behavior within a client’s environment. KIO Networks is working with CyberFlow Analytics to use their technology within our network and managed-services environment to help our customers address the ever-increasing challenges of cybersecurity. San Diego has a strong cyber cluster and Cyberflow Analytics is one company that proves that. As the Internet becomes the Internet of Things (IoT), CyberFlow Analytics allows us to address the more varied security requirements that IoT necessitates. We see ourselves expanding our data center and cloud computing services along our current fiber footprint from San Diego to the East Coast, with points of presence (PoP) in Los Angeles, Phoenix, El Paso, Dallas and Miami. We are also hoping to launch a PoP in New York within the next few months, allowing our customers to utilize our network to pass data from New York to Los Angeles. In addition, we will be growing our cross-border network assets as far south as Peru and overseas into Spain. We're aggressively growing as a company that can truly support the needs of our international clients across the globe. Leveraging multiple platforms for cloud computing technologies is a big piece of our strategy as we continue to anticipate the needs of the market and build specific services and capabilities that align with those needs. There are approximately 1.3 million people who are blind living in the United States. Like any other individuals, they need and want jobs. This is where Lighthouse for the Blind comes in. As a privately-funded non-profit, they provide employment, support, and training opportunities for people who are blind, deaf-blind, and blind with other disabilities. Their military roots run deep, which makes San Diego an ideal location for Lighthouse. Not only do they serve many veterans with disabilities, but the military is also one of its largest customers. This week, we spoke with Kirk Adams, president and CEO, to learn more about why this social enterprise operates in San Diego. We provide jobs to people who are blind, deaf-blind, and blind with other disabilities. In San Diego, we operate a Servmart, which is a store where military, civilians, and contractors can purchase the supplies from paperclips to tactical equipment and clothing. We specialize in offering a high volume of AbilityOne (blind-made) products and expert knowledge of military requirements. We also operate two Contract Management Support (CMS) services in San Diego and are currently closing out contracts for NAVSUP Fleet Logistics Command in downtown San Diego, and DCMA (Defense Contracting Management Agency) in Kearny Mesa. CMS services help mitigate the critical government shortage of contract specialists by providing post-contract award administration support services. 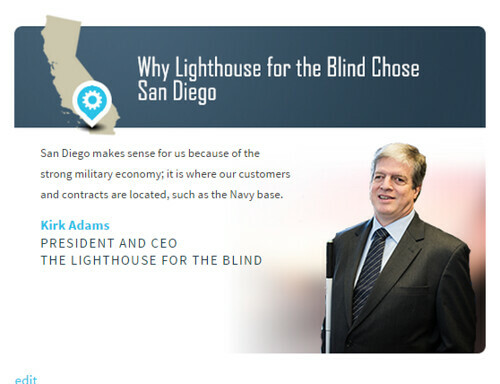 The Lighthouse employs 14 employees who are legally blind in San Diego. On the West Coast, we employ more than 240 people who are blind in 11 different locations. San Diego makes sense for us because of the strong military economy; it is where our customers and contracts are located, such as the Navy base. Additionally, there is a large population of capable blind adults looking for employment in the San Diego area. 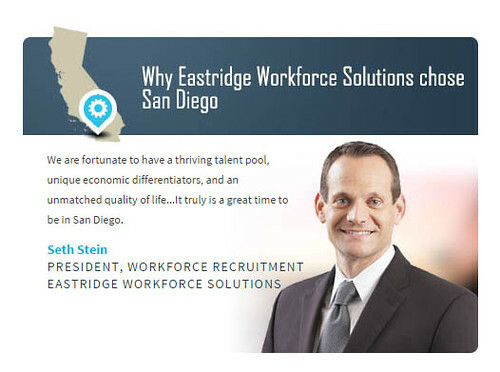 Growing our business means jobs for San Diegans who are frequently overlooked in traditional employment settings. Our mission – “to create and enhance opportunities for independence and self-sufficiency of people who are blind, deaf-blind, and blind with other disabilities” – stems from veterans who are blind returning from WWII with no hope for employment. Today, our mission is more critical than ever with the numbers of service men and women returning blinded from IED’s (improvised explosive devises) used in Iraq and Afghanistan. Qualcomm is committed to an environment of inclusion in which all people, including those with disabilities, have equal access and opportunities. Qualcomm connects students with disabilities of all ages to help prepare them for their careers and partners with local universities for Disability Mentoring Day. 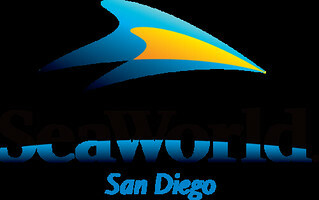 They also participate in the annual San Diego career fair for people with disabilities. In five years we hope to have more than 25 employees who are legally blind employed in the San Diego area and a much larger community presence.